It would interesting to compare the collections of Dasavatharam and Sivaji. Last week Dasavatharam started tumbling and falling from its 12th position to a worrisome 19th position at the UK box office although with marginal effect on the collections. The movie collected $426,770 during its second as opposed to Sivaji that collected $546,738 in its second week at the UK box office. Rajinikanth Rocks! Another interesting stat to be noted is that Dasavatharam is released in 8 more than theatres than Sivaji. 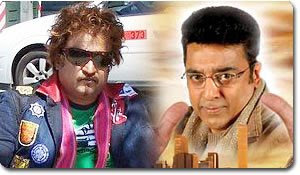 Analysts predict Dasavatharam to fetch $700000 in total while Sivaji garnered $800000 during its run. While this is the status of UK box office, its Malaysian counterpart does not present a rosy picture either. The weekend has registered a collection of $1,208,007 while Sivaji garnered $1,471,454 during the same period. Malaysian trade experts aver that it would be a Herculean task for Dasavatharam to reach $ 2.5 million that Sivaji garnered during its run. To add to the woes, the Will Smith starrer Hancock is also releasing this weekend that is sure to dampen the Dasavatharam collections. This shows Rajinikanth has more fans than Kamal! THOUGH RAJINI HAVE MORE FANS THAT ARE MENTALLY WEAK AND CATTLE CLASS. BUT KAMAL FANS ARE WELL EDUCATED WHO CAN UNDERSTAND GOOD AND BAD. IN GERNERAL RAJINI FILM IS LIKE A BAR AND KAMAL FILM IS LIKE A SCHOOL. IF ARE GOOD PARENT WILL U ADMIT UR CHILDREN IN A SCHOOL OR A BAR?. THINK,THINK,THINK. THOUGH RAJINI HAVE MORE FANS THAT ARE MENTALLY WEAK AND CATTLE CLASS. BUT KAMAL FANS ARE WELL EDUCATED WHO CAN UNDERSTAND GOOD AND BAD. IN GERNERAL RAJINI FILM IS LIKE A BAR AND KAMAL FILM IS LIKE A SCHOOL. IF ARE GOOD PARENT WILL U ADMIT UR CHILDREN IN A SCHOOL OR A BAR?.